I know that as far as seasonal dishes go, gingerbread themed things fall in the Thanksgiving-New Years category. I am also aware, believe it or not, that it is now mid-January. Even late January, depending on how you split your month. You see, I agree. I was going to make this cheesecake for Dan’s work holiday party. But then it snowed, like two feet. So the party got rescheduled. And then it got rescheduled again so that it was during the work day. Which meant that Dan was metroing with the dessert, which made brownies the dessert of choice over say, cheesecake. So brownies it was. The thing is, ever since I conceived of this cheesecake, it’s been on my mind. And when I couldn’t make it for the holiday party, it was the first dessert I thought of every time I had an occasion to make dessert. So this weekend when we had some company I thought, why not? Even though it’s way past the traditional gingerbread season it’s still winter. What’s stopping me? It turns out, nothing. I dove in, head first, and made a gingerbread cheesecake. 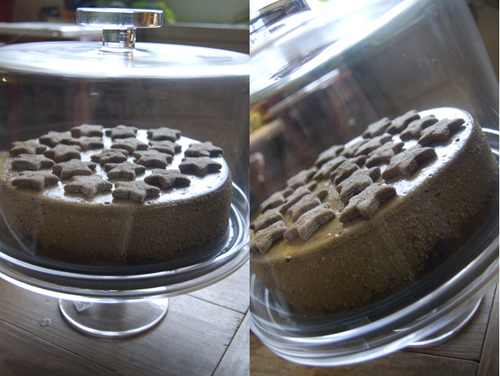 Incidentally this is also the first cheesecake I’ve ever made. As this website has documented for a year and a half, I am really a pie person. I like cake occasionally, but when given the opportunity I usually ere towards pie. However, I married a cheesecake man. Dan loves cheesecake. And since marriage is about compromise, I figured it was high time for me to learn how to make cheesecake. I researched, learned all about the best methods and techniques, and borrowed a friend’s roasting pan (so as to give the cheesecake a proper bath). Amazingly enough, this went perfectly. At least 50% of the time when I try something new, it fails. Or at least has some defects. But this cheesecake was near perfect. I took the advice I found online seriously, omitting flour (to ensure silkiness) and baking it in a water bath (to ensure silkiness). I even sent poor Dan out to get more cream cheese when it looked like I was woefully behind. All the finicking and stress was well worth it, though. It was delicious. Topped with fresh gingerbread cookies it was silky, full of flavor, and beautiful. Grind cookies in food processor. 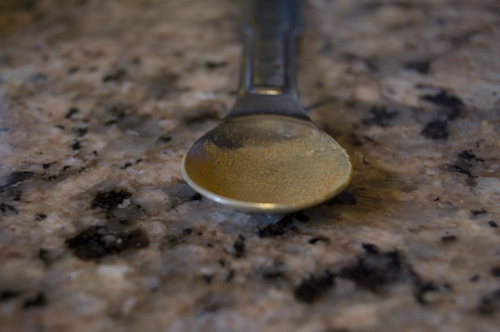 Mix with butter and press into the bottom of a buttered springform pan. Bake at 350 for 15 minutes. Let cool. 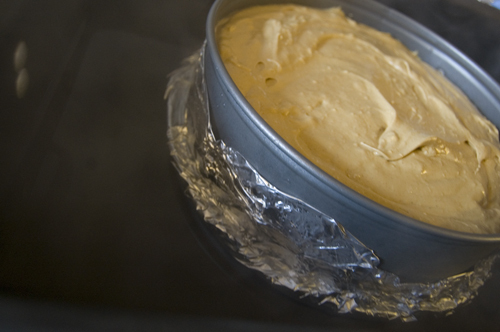 Cream creamcheese in mixer on medium speed until light. Add in butter. 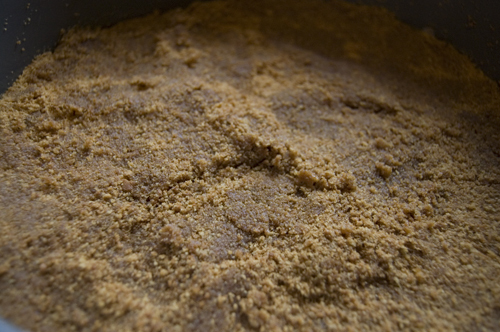 Add in sugar and molasses. Mix in eggs, one at a time. Add in spices. 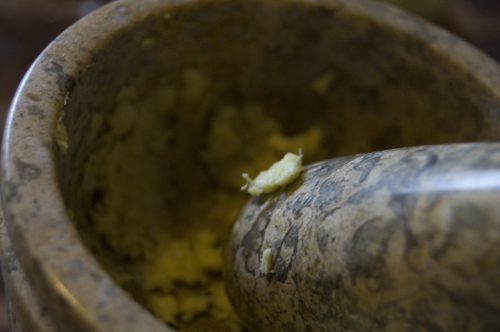 Chop your ginger and press in mortar & pestle. Sprinkle over crust. Pour filling into the springform pan and place the pan in a larger roasting pan. When the water is boiling, pour around the springform into the roasting pan, surrounding the cheesecake with 2 inches of water. Top with fresh baked gingerbread cookies. Great idea!!! And I love the photographs in this post also! 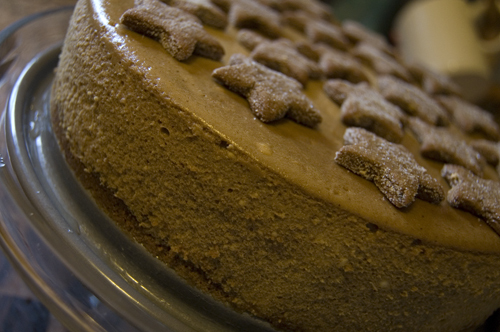 The gingerbread cheesecake that is on the biscuits and such website looks delicious. Can this cheesecake be frozen? yes, this cheesecake freezes beautifully! 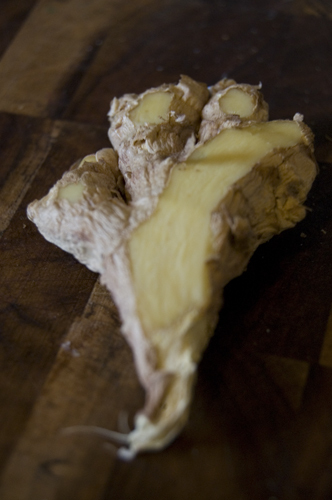 The cheesecake looks great but not sure how much of the spices and fresh ginger to add. Can’t wait to make this! I love gingerbread ANYTHING so am trying this today!!!! Looks and sounds wonderful!